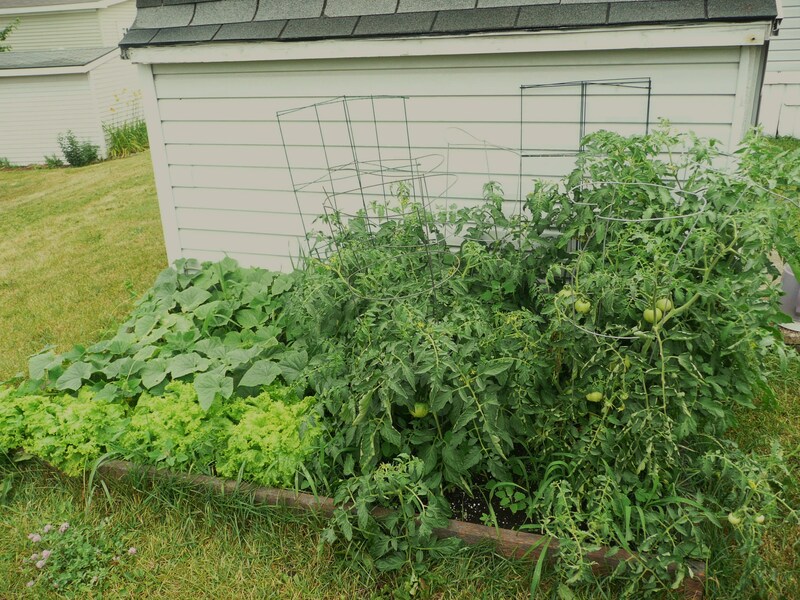 In May of 2009, my husband and I finally got around to carving out a bit of garden space. It was just a 4X8 boxed space next to our shed filled with a mixture of top soil and Miracle Gro dirt. Princess and I planted cucumbers, green peppers, yellow squash, tomatos and sugar peas. We had a great time digging and weeding and watering and picking. Truth be told, however, our summer’s yield wasn’t really that much. The plants never really took off given the care we gave them. We had a fair amount of tomatoes (but not enough to keep us from needing to hit the farm stand down the road), a couple of really cute green peppers, several handfuls of sugar peas to snack on, a grand total of 3 summer squash and some rather misshapen cukes. This year, her interest had kind of waned and I decided to minimize our planting. I thought maybe our rocky soil really wasn’t condusive for growing anyway. I planted 7 tomato plants of varying variety because we really do love tomoatos, 4 hills of cucumbers and – on a tip from a friend – 4 leaf lettuce plants. It was a nice garden and I was looking forward to a minimal yield. Like last year. Our garden in July of 2009…..
Our garden in July of 2010…..
Garden plants are growing so fast and furiously that I don’t even have to worry about weeds….much. The tomato end is like jungle with lady bug natives fighting off the bees. The leaf lettuce is growing so fast that I can’t keep up with it…and we LIKE salads. I think the neighbors are tiring of the plastic bags of cut lettuce I send their kids home with. 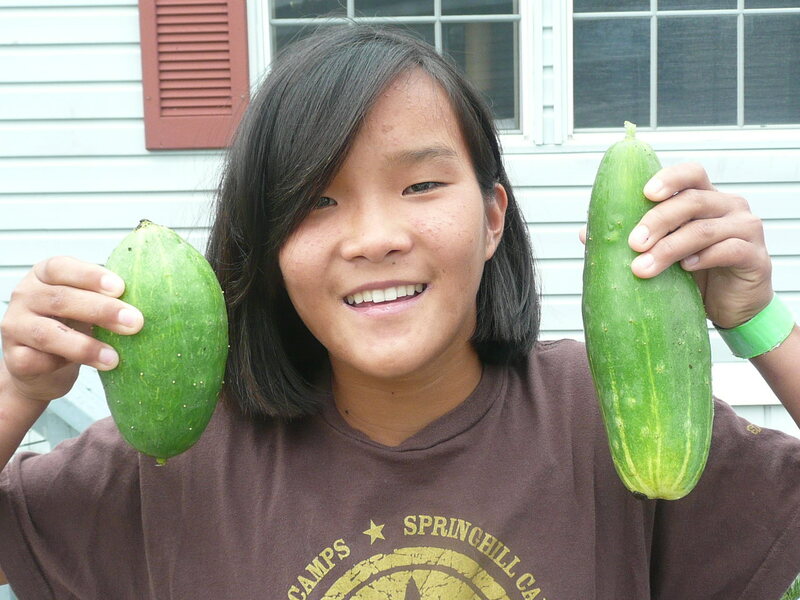 We lost our first little cucumbers to the heat of last week. Just couldn’t keep up with the watering needs. But I am not worried. Those vines are loaded with more blossoms. The tomatos are so heavy with green fruit that I have had to set up several more tomato cages around OTHER tomato cages to support them. I am even thinking of looking up a recipe for Fried Green Tomatos because the branches are breaking with their weight. 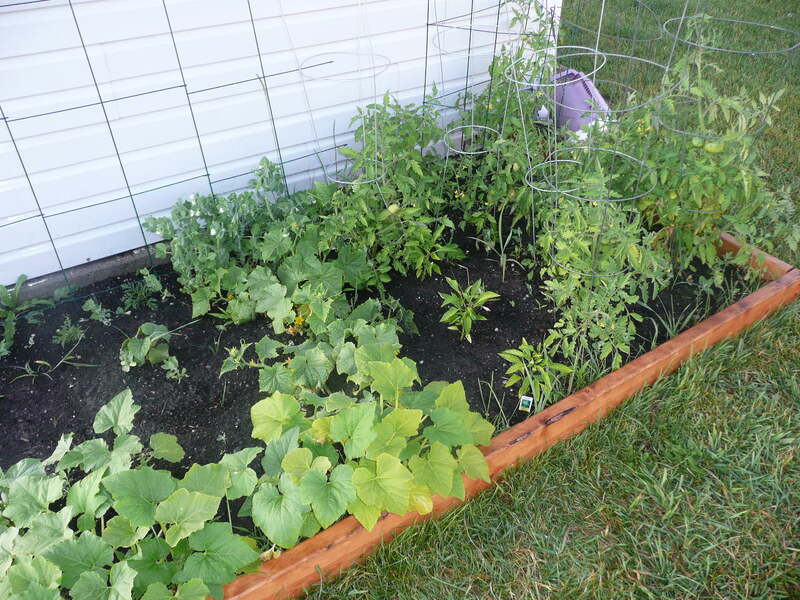 I can’t explain the abundance of this summer….except that fewer plants made more room to grow. Maybe? Or perhaps there is a lesson I need to learn here. Instead of wanting for more…..more house……more salary…….more ‘things’……..I should just realize that we will ‘get’ more with less. So….okay God, I get it. I’ll stop whining and just wait. And find something to shore up those tomato plants with……again.